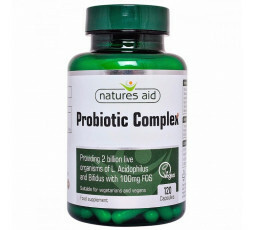 Natures Aid Probiotic Complex with Bifidus and FOS. In our bodies there are twenty times more bacteria than there are human cells and we all contain more bacteria in our bodies than there have ever been people on the planet. Probiotics are often called our friendly bacteria and are the beneficial bacteria normally present in the digestive tract. The use of these beneficial bacteria dates back thousands of years to nomadic tribes who regularly consumed milk fermented with friendly bacteria. A healthy gut typically contains as much as 4lbs of bacteria, of which 85% are lactobacilli and 15% coliform bacteria. However, the typical colon bacterial count today shows a ratio that can be so distorted that it actually shows these figures in reverse. The friendly bacteria are so important for proper digestion and other useful functions, such as preventing overgrowth of yeasts and other pathogens and the manufacture of vitamin K.
After using antibiotics - the use of antibiotics upsets the natural balance and probiotics are often recommended to rectify the situation. Antimicrobial - particularly of use for conditions such as candida, thrush, food poisoning and diarrhoea (travellers tummy). Digestion - imbalances in the bacterial make-up of the intestine can lead to symptoms such as those experienced by irritable bowel syndrome sufferers. They assist in the digestion of proteins that produce many beneficial substances such as enzymes, B vitamins and antibiotics. Circulation - are useful in lowering cholesterol. Detox - may be useful in helping the body to detoxify certain harmful substances. Lactobacillus acidophilus and Bifidobacterium bifidum - these are two of the most important members of a healthy digestive tract with Bifidobacterium being the first to colonise the infant gut. They help to promote growth, aid in lactose digestion and increase mineral absorption. They also contain antimicrobial factors, stimulate the immune response system and reduce blood serum cholesterol. Fructo oligosaccharides (FOS) - in the group of products commonly referred to as prebiotics, FOS have been well researched for their role as a promoter of the health of good bacteria. They are stable under acidic conditions and get to the colon intact where they promote the growth and multiplication of the friendly bacteria. May be taken at the same time as antibiotics as long as they are taken a few hours apart to avoid the friendly bacteria being destroyed. 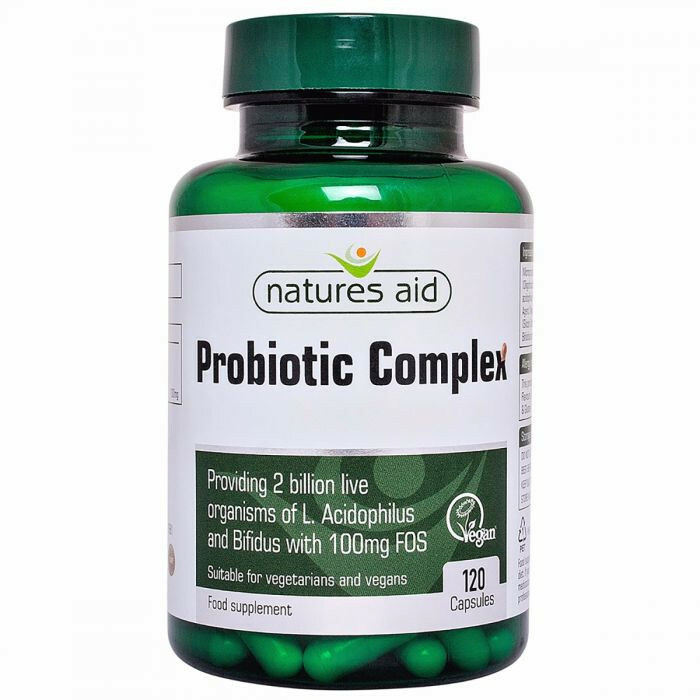 Why Choose Natures Aid Probiotic Complex? Each capsule typically provides 2 billion live organisms (at end of shelf life) of two of the most beneficial strains, Lactobacillus acidophilus and Bifidobacterium bifidum with 100mg of fructo oligosaccharides (FOS). SUITABLE FOR VEGETARIANS AND VEGANS AND DAIRY FREE.